In Hong Kong and Indonesia today, Moto Z users are in the process of receiving the update to Android 7.1.1. The phone originally shipped last year with Android 6.0 pre-installed, and was eventually updated to Android 7.0. Once the notification is received that the update has hit your Moto Z, make sure that the device is connected to a Wi-Fi or strong cellular signal before continuing with the updating process. At the same time, the battery on the phone needs to be charged to at least 50%. If the update has not been received yet, you can try to have it sent to you manually by going to Settings > About Phone > Software updates. The entire installation process should take 10 to 15 minutes to complete. Android 7.1.1 includes the July 2017 security patch, the Duo video chat app, the ability to send GIFs directly from the keyboard on apps like Google Allo, Google Messenger and Hangouts, the use of round icons and more. 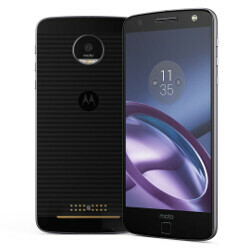 Now, the big question is whether those in the U.S. with the Moto Z DROID will also be receiving Android 7.1.1 shortly, or if Verizon and Motorola plan on going directly to Android O for this model and the Moto Z Force DROID. Both of the latter two handsets are stuck on Android 7.0 for the moment. Member when Motor phones updates faster than Nexus? No way! In fact, Motorola was already much better in this area than today!